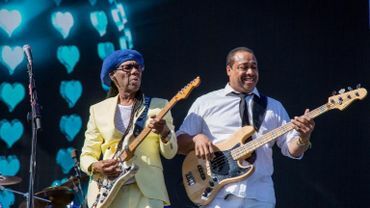 Le leader de Chic sera le curateur de la prochaine édition du Meltdown Festival qui se tiendra du 3 au 11 août dans la capitale britannique. Till The World Falls - 13/02/2019 Provided to YouTube by Universal Music Group Till The World Falls · Nile Rodgers · CHIC · Mura Masa · Cosha · Vic Mensa It’s About Time ℗ A Virgin EMI Records recording; ℗ 2018 Nile Rodgers Productions LLC, under exclusive license to Universal Music Operations Limited Released on: 2018-09-28 Producer, Associated Performer, Recording Arranger, Guitar, Background Vocalist: Nile Rodgers Producer, Associated Performer, Drums, Percussion, Programming, Keyboards: Mura Masa Manager: Merck Mercuriadis Producer, Associate Producer, Associated Performer, Drums, Percussion, Programming, Keyboards, Bass Guitar, Vocoder, Background Vocalist, Studio Personnel, Recording Engineer: Russell Graham Producer, Associate Producer: Om'Mas Keith Studio Personnel, Asst. Recording Engineer: Stefano Civetta Studio Personnel, Mixer: Mark 'Spike' Stent Studio Personnel, Assistant Mixer: Michael Freeman Studio Personnel, Mastering Engineer: Miles Showell Producer, Additional Producer: Jeff "Gitty" Gitelman Associated Performer, Vocals: Cosha Associated Performer, Vocals: Vic Mensa Associated Performer, Trumpet, Tenor Saxophone, Baritone Saxophone, Trombone: Bill Holloman Associated Performer, Background Vocalist: Kimberly Davis Associated Performer, Background Vocalist: Anderson .Paak Associated Performer, Background Vocalist: Anais Aida Associated Performer, Spoken Word: Alice Bennett Composer Lyricist: Nile Rodgers Composer Lyricist: Brandon Paak Anderson Composer Lyricist: Anais Aida Composer Lyricist: Neo Joshua Composer Lyricist: Alexander George Edward Crossan Composer Lyricist: Victor Kwesi Mensah Auto-generated by YouTube.